Today has been a long day! It started with a phone call at 4:30 AM from Louise's sister-in-law Jennie who called to tell us that Louise's mom had just passed away. Never a good way to start the day. It isn't a good way to end the day either. 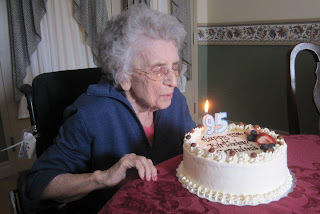 Lena had just celebrated her 95th birthday when she passed, and she had lived a good long life. She was well loved by all of her children, grandchildren, great-grandchildren, in-laws, friends and care givers. It is funny how you just remember the laughter and love at times like these. I suppose that later you will remember the missed opportunities, the words said in anger and all of the other "what-ifs", but for now it is just the love and laughs. She was a good woman and she made an impact on her little corner of the world and really, isn't that what we all hope for. Right now, Louise is selecting photos and I am scanning them to put them in a slide show. She is pretty much exhausted,but she still carries on because this needs to be done. Louise needs to sleep, but that I fear is the thing that will not come easily. I will be here for her if she needs me, just as she was there for me when I needed her. That is one of the things that we do well together. One of us is strong whenever the other is weak. Today was phone calls. The news had to be passed on, the arrangements need to be made and rather quickly. The family will gather from two different countries and at least three provinces. Today was booking flights. That needed to wait until the funeral arrangements had been made. Today was writing and checking the obituary, making sure that no one is forgotten, while being pretty sure that someone will be. Today was calling friends and making arrangements for lodging and visiting while we are in Oshawa. Today was for receiving condolences. Today was laughing, which is how I deal with this kind of thing. Today was crying. Today was hugging. But mostly, today was for love. Thanks Bri. Hope all is well in lotus land.